Discussion in 'The War In The Air' started by Kristian Holford, Oct 20, 2018. I've been trying to understand what exactly my grand father was doing during the Second World War. He spent some time in the Far East with the RAF but I have no real details. From what I'm aware he was some form of airfield defense guard, however, I was hoping this service record would clarify what he was doing and where. Unfortunately I really can't work out what most of this means, is anyone able to clarify or explain all the abbreviations? One could be either "Station Iceland" or "Station Ireland"
Retrained to Fighter Plotter in 1944 (my old job in RAF) and promoted to Leading Aircraftsman. Lots of useful stuff here about ww2 Air Defence Systems. If I spot any more I'll add them in bold. Kristian Holford and Tricky Dicky like this. Next to clerk it says S.D? I believe that means special duties, do you know what kind of duties that would mean? SD could be Special Duties but no idea on context. There are many RAF buffs on this forum so they should have the answers. 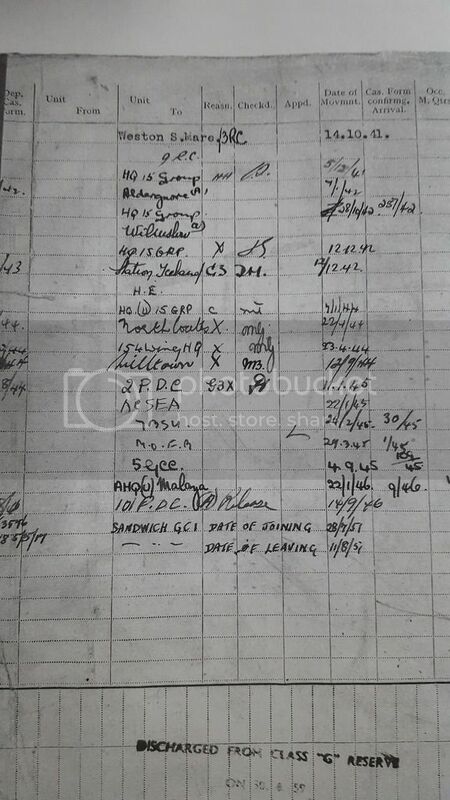 Clerk SD - shows the date he joined [14.10.41] I wouldn't think he would have been assigned Special Duties on his first day ?? Clerk General Duties - authorised for all non classified infomation and files. Usually signals related bods were SD. This is mirrored in the Officer Branch SD were it was usually Codes/Cyphers and Adjutant retreads tasking. Thanks for all the information chaps, it's awesome to finally get some kind of picture as to where he was and what he was doing. I really want to find out who he was with in the Far East and by the looks of things that might have been just in 1945. I've also tried googling 154 Wing HQ but can't find any information on the matter. 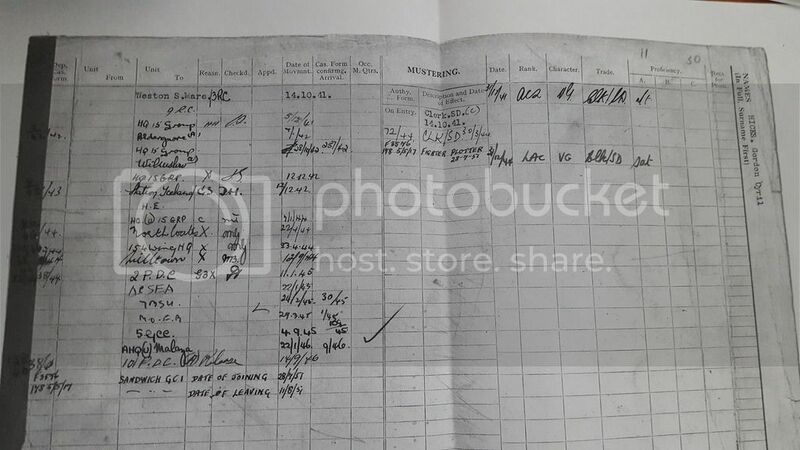 Whilst the Army kept "War Diaries (WDs)", the RAF kept "Operations Record Books (ORBs)". Every operational flying squadron's ORBs is available online through The National Archives (TNA). Unfortunately most RAF Stations, wings, groups and commands and RAF Regiment ORBs are not yet available online. You can still Search for them using the TNA Discovery search engine and see what comes up. Its a bit hit and miss I am afraid so you might have to try a few times. Here are the two ORBs for 154 Wing ORB. AIR 26/221 and AIR 26/222. If you want to see these you will either have to visit Kew yourslf or ask one of the many chaps on the forum who will copy them for you at a significantly better cost than TNA. Some light reading on history of RAF in WW2.